Many small- to medium-sized business owners rely on their local bank, friends and family, or personal savings for most or all of their company’s financing. Some may also use SBA loans from the U.S. government, which provide a financing option for those who are turned down for traditional bank loans. Once they secure initial financing, the company might rely on internal resources to increase revenues; this is known as organic growth. For companies looking for faster, more significant growth opportunities, there are a range of other capital options to consider. 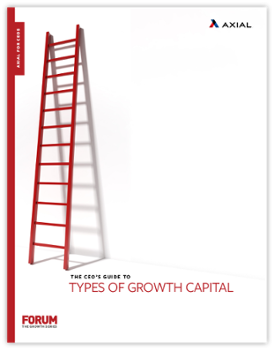 In this guide to types of growth capital, we’ll consider the basics of debt vs. equity financing, provide an introduction to capital structure, and help CEOs understand what questions to consider when evaluating their options.